Three days late is better than never, right?? :) My little man came down with the cold bug that hit his daddy and me last week and weekend. This was my first experience with a sick baby ever. I feel blessed to have made it 10.5 months without him having a hard illness to overcome. And man, was it hard to watch him suffer for those couple of days. Today he is back on the upswing, still with a raspy cough, but tearing up the house like normal again. Will tell you what we did to boost his immune system in a future post. On Saturday, we talked about the importance of choosing healthy free-range chicken nuggets, and I shared my grain-free recipe for chicken nuggets from my Kid’s Birthday Party e-Book. 1.) In a medium bowl, stir flax seed meal, sea salt, baking powder, dried herbs together. 2.) In a small bowl, whisk together water, eggs, coconut oil, and stevia until smooth. Pour liquid mixture into flax seed mixture, stirring until smooth. Cover with a tea towel and put in a warm place until doubled in size for about 1 hour (I put mine on top of my fridge). 3.) Heat oven to 425 degrees F. Grease your pizza pan with coconut oil. 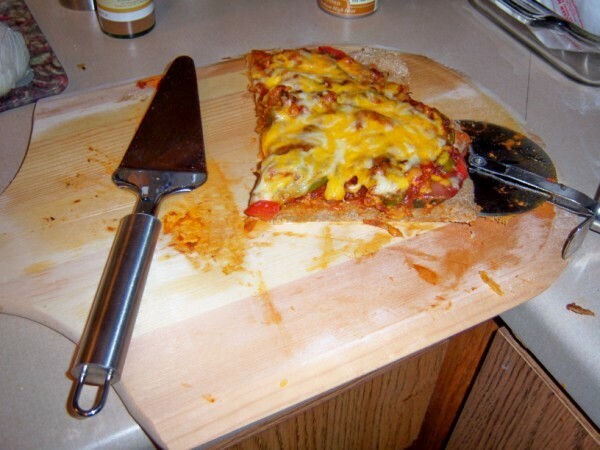 Uncover dough and pour out onto pizza pan. Press into circular shape (or oblong/rectangle if desired). Bake for 15 minutes on center rack of oven until cooked. Remove from oven and allow to cool for about 15 minutes. Add favorite toppings, then return to the oven on Broil to bake for a final few minutes just to melt the cheese and crisp the edges. 1.) In a medium bowl, mix together the flour, water, sea salt, cumin, and olive oil. Cover with a tea towel and let batter rest for 2 hours at room temperature. 2.) Heat the Broiler in your oven. Oil your pizza pan with coconut oil (I also like to do this crust right in a large cast iron skillet). Pop it in the oven for a few minutes, until the pan is nice and hot. 3.) Carefully remove the hot oiled pan from the oven. Place on stove top (make sure it’s stable!) Pour the batter onto the pan, swirling it around with a spatula until it is of even thickness and to the edges of the pan. Pop it in the oven on the top rack. 4.) Bake until the socca is firm and beginning to blister and burn. The exact time will depend on the heat of your broiler (for me, about 8-10 minutes). your kids won’t know it’s a vegetable! the cheese helps it crisp up to be firm enough to hold a slice in your hand. 2.) Heat 2 Tablespoons water to boiling in a medium saucepan with a steam basket inserted. Add the cauliflower rice and cover tightly over Medium-High heat. The cauliflower will start to break down and steam on its own — do not add more water to the pot. Let it steam for about 8 minutes, until the cauliflower rice is cooked but not mushy. Measure out 1 cup of cooked cauliflower rice for one 12 inch pizza. Let sit to cool. 3.) Preheat your oven to 450 degrees F. Combine cooled cauliflower, mozzarella, Parmesan, egg, oregano, garlic powder, onion powder, and sea salt in a medium bowl. Spread the dough into a thin round layer on to your pizza pan covered with parchment paper. Brush the dough surface with a thin layer of olive oil. 4.) Bake for 20 minutes or until the crust is uniformly deeply browned. Remove from the oven, transfer, still on the parchment paper, to a wire rack. Allow to cool completely for a more sturdy crust. 5.) When your crust has cooled, top with a light brushing of pizza sauce and toppings. Return to the oven under the Broiler setting for a few minutes until cheese is melted. 1.) Preheat oven to 400 degrees F. Line your pizza pan with unbleached parchment paper. In a large bowl, whisk the eggs together with the kefir (or yogurt) and sea salt. Add the coconut flour and whisk until very smooth, about 2 minutes until the coconut flour as absorbed the eggy liquid. Stir in the onion powder, garlic powder, oregano, basil, and Parmesan cheese. 2.) Pour the batter onto the paper lined pan. Use a spatula to spread the batter to the edges and to an even thickness. This is a thin crust dough, so it will be quite thin. 3.) Bake on middle rack for 10-12 minutes, until lightly brown. Remove pan from oven, add sauce, cheese and other toppings as desired. Place back in the oven on to rack and Broil until crispy on edges and cheese melts. 1.) Preheat oven to 350 degrees. In a food processor, pulse the cashews until a fine flour has formed. Add to the food processor the almond flour, coconut flour, baking soda, sea salt, and garlic powder, then process the mixture on High for 1 minute. 2.) Add the eggs, almond milk, apple cider vinegar, olive oil, water, and herbs and process for another minute. Scrape down the sides of the bowl and pulse a few more times until you have a very smooth dough. Let the dough rest for 2 minutes to let the coconut flour absorb some of the liquid. 3.) Sprinkle a piece of unbleached parchment paper with a bit of almond flour, then turn the dough out onto the parchment paper, forming it into a ball. Flatten the dough ball slightly, then sprinkle a little more almond flour on the top. Place another piece of parchment on top. Lightly roll out the dough into a circle that is about 1/4 inch thick. 4.) Remove the top piece of parchment paper and discard. Lift the corners of the bottom parchment piece hold the dough circle and slide it onto your pizza pan. Bake for 12 minutes or until it is golden brown around the edges and firm in center. 5.) Remove from oven. Top with sauce, toppings, and cheese. Return to oven and Broil on top rack for a few minutes until crisp on edges and cheese is melted. 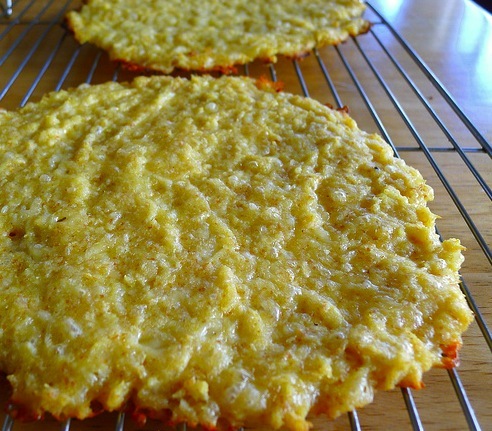 So there you have it, my top 5 tried and true grain-free pizza crust recipes. I hope you enjoy!! Lots of options here, from thin crispy crust to doughy chewy goodness! You’ve got to try them all or else you’re missing out! Enjoy! 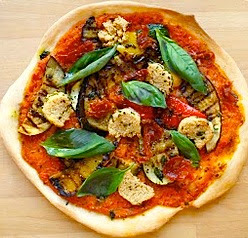 I am so excited about grain free crusts that aren’t 90% cheese! The only “advanced plan” crusts that I have ever found were soo full of cheese that I hated to make them. I am going to be trying these ASAP! Thanks so much!!! I love that you have five different recipes! Thanks for sharing! I’m pinning this. This is fantastic, 5 different recipes in one place! Found your link on Frugally Sustainable. Hi there and welcome! Thanks for stopping by! I hope you enjoy these pizza crust recipes. They are my faves…and I couldn’t share just one, so all 5 are here as a result! :) Enjoy!! Hi Tara, Thank you SO MUCH for catching that typo mistake! It is 2 Tablespoons of water. I just needs a little bit of water to start the steaming process, then the cauliflower will break down and steam the rest of the way from its own moisture. Fixing that mistake now. thank you again! ENJOY! Trying out #5 for lunch today with organic pizza sauce, artichoke hearts, black olives &shredded raw cheese! flour ingredients sit for two hours. know what I did wrong. It has too much liquid to make a pizza. You can stir in chickpea flour a Tablespoon at a time until it reaches the right thickness. I made the coconut flour crust for my grain free toddler today. It was great! I made a pumpkin-based sauce with lots of garlic and herbs, and we used some raw goat feta on top. It was amazing! Totally eased our pizza ravings. Thanks! Woot!!!! Ella loved the cauliflower crust…I highly doubt there is any other way I would be able to get her to eat cauliflower. Thanks for the great recipe!